I guess Spring must be here judging by the way things are starting to pop. We got our first batch of 200 broiler chicks almost two weeks ago, and there should be another batch of 200 here on Wednesday of this week. Then another 200 every other week until the beginning of September. This first batch should be heading out on pasture next week as long as the weather looks half decent. The goats actually have been kidding off and on since February. I've lost count of how many kids there are at this point, but I'd guess it's somewhere near a dozen. Bubbles the bull went back in with the cows on the 4th of July, which according to the gestation chart would make the due date of any cow bred on that date the 12th of April. 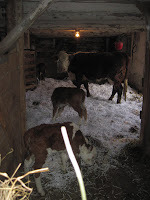 By the 15th of April we had 9 calves on the ground. I guess Bubbles didn't waste any time. Unfortunately for him I'll be keeping him sequestered for an extra 2 weeks this year because it works out much better for me (and the cows) to have the calves born out on pasture. This year, and most years really, we just aren't quite into grass season by the middle of April.